Southworth Sailor: A winning team! Though they won’t take the winner’s stand in the Indy 500, they’re champions in my book. Today, the Eides and Bulthuis’ hit the race track at a high speed go-cart track. The Bulthuis’, including me, kept the bottom places filled, but we had fun. These go-carts really go fast! We raced three times with 30 laps each time. 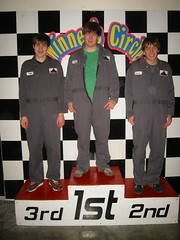 My nephews, Mikal and Zachary, consistently took the top places. Brother-in-law Mike was pretty proud of his fastest lap time, which beat everyone else. The ladies kept the cameras and cheers going. We wrapped up the evening with a dinner at Outback Steakhouse.